The presidential campaign may be over, but there are still many lessons to be learned from the Obama campaign’s stunningly successful online fundraising efforts. Over the course of his 21- month presidential campaign, Barack Obama’s online fundraising machine raised an unprecedented $500+ million1 online from some three million donors who made a combined 6.5 million donations to the Obama campaign online. Although most nonprofit organizations cannot realistically expect to build a list of three million online donors in a 21-month period, many of the campaign’s successful online fundraising strategies are simple enough for any organization to implement. 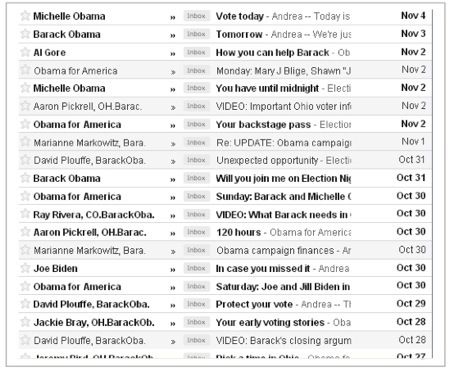 Below are a few of the M+R staff’s favorite tools from the Obama fundraising toolbox. 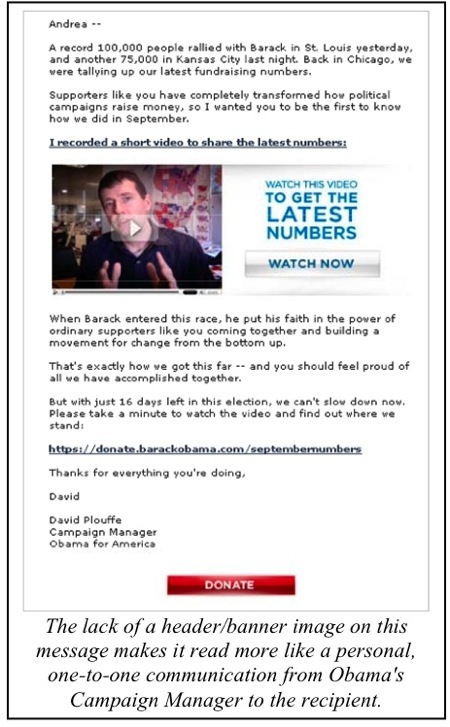 Although Obama’s Campaign Manager, David Plouffe, gave very little face time to the media, he communicated often with Obama supporters by email. This made his communications a hot commodity and made the recipients feel special. His emails felt personal, and the videos the campaign shared were often more along the lines of a home video than a highly produced commercial piece. Sending emails without a header image (see example below) also made the message feel more personal, as if it were a one-to-one email from Plouffe to the recipient, instead of the one- to-millions email it was in reality. The bottom of every email message from the Obama campaign (not just fundraising messages) featured a big, red “DONATE” button (see at right). If the content of the message was compelling enough to inspire a donation – even if there was no specific request to donate included in the copy – the big red button provided readers with easy access to a donation form. M+R has long recommended that organizations include this type of passive donation link at the bottom of each email message they send. Although we cannot tell for sure how much money was raised via the big red button in the Obama campaign’s emails, we do know from our own clients’ reporting that including such a button or link in each and every email message produces a steady stream of revenue with a very minimal amount of effort on the part of the organization sending the messages. The Obama campaign’s online fundraising success is a good example of the simple tenet “ask and ye shall receive.” Although we would NOT recommend that nonprofit organizations mimic the extremely high volume of fundraising emails sent by the Obama campaign, it is certainly true that an organization must ask for money via email regularly in order to successfully raise money online. We have also found that if your list members perceive a specific situation or campaign to be urgent, you can bend the rules by sending far more fundraising appeals than your list members would normally tolerate. Variety also helped keep list fatigue at bay when message volume was heavy. By mixing up message content with different personalities, videos, insider updates, and other unique content, your audience may find more reasons to stay interested during an extended campaign. The Obama campaign asked previous donors to provide the match funds for new donors. Although the campaign was not the first to use this model, it is still a very savvy way to compel donors to give multiple donations while also encouraging prospective donors to make their first gift. This approach made previous donors feel like their gift inspired another to join a movement that they both care about – and made giving very personal. The appeal went beyond the usual message to “double your money” by creating a feeling of community. … You’re one of those who’ve given already this year, and I am deeply grateful. But right now you can help convince someone to make their first donation of 2008 by offering to match their gift. Including compelling and heart-tugging videos in emails and on donation landing pages gave visitors an added push to take that next step and donate. 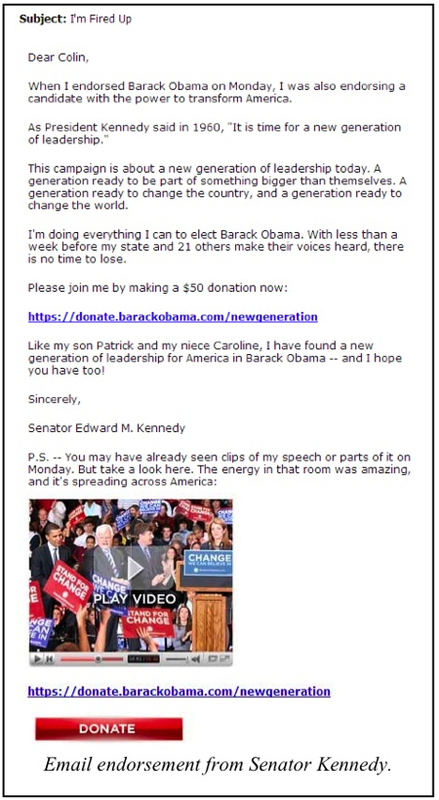 One notable example was an email and video appeal from Ted Kennedy following his endorsement of Obama (see message at right). The campaign used this message and video to make the most of an emotion-filled moment, given Senator Kennedy’s illness and his historic endorsement. In addition to videos on national issues, the campaign also used geographically-specific videos. In the important battleground state of Ohio, for example, the campaign posted videos of Obama canvassing door-to-door near Toledo, talking to folks about the issues facing their state. The email and video were placed near a button inviting viewers to sign up to volunteer. Although nonprofits can’t make use of federal filing deadlines, there are plenty of other good deadlines available to them – the end of the calendar year, the closing of their own fiscal year, etc., not to mention all the compelling deadlines tied to their advocacy and policy work. Like the Obama campaign, your organization can make a strong case that a final surge in giving before an upcoming deadline could have a lasting impact on your organization and your ability to achieve your mission. These represent just a few of the tools and innovations Obama’s online team put to good use. There are many more, and any one of these strategies could give your organization’s fundraising an edge. If you have questions about our data or conclusions, or if you would like to discuss your organization’s online fundraising strategy, please don’t hesitate to get in touch with us.